How to Book Muktinath Temple Tour ? How to go Muktinath Temple ? One of the many questions people that are traveling to Muktinath ask is how to get there & what will be the best time of the year to tour Muktinath temple. Located at an elevation of 3710m above the sea level, Muktinath is certainly one of the most sacred and religious shrines of Nepal. It’s placed on the bottom of Thorong La which is an entrance to the grand Himalaya locating in between Nepal and Tibet. A great number of people worldwide today look for to Muktinath Darshan Tour to get liberation or Moksha. Muktinath is 1 of the eight holy temples for Hindus worldwide. Besides carrying its own spiritual significance, this region also provides a stunning sight of the royal Himalayas & the surrounding around. Although Mustang is recognized as the desert of Nepal, the mesmerizing panorama of the place will leave you speechless & make you come here again and again. As far as reaching Muktinath is concerned, it can be accomplished either via jeep or flight. If you’re fit enough you can also trek Muktinath. You can go for a direct fifteen minute flight from Pokhra to Muktinath. Or either opt for a jeep or bus to get there. Travelers can tour Muktinath any time of the year. However, as the area locates in 1 of the Himalyan provinces of Nepal, you may have to encounter unfavorable climate condition if you get there on the inappropriate season accidentally. Hence, the ideal time to tour Muktinath is either from March-May, or September-October. Tourists can explore it after February and before November. June-August is the monsoon month when you’ve to encounter pretty heavy downpour. SO, it’s wise to ignore visiting Muktinath throughout the rainy months as the roadways are rocky and you may encounter unforeseen difficulties here. Besides rainy month, it’s also wise to ignore visiting Muktinath during the winter season. Particularly during December & January. Throughout this period, temperature drops to minus degree Celsius. If traveled throughout the spring season which begins from March-May, you can completely relish the incredible backdrop around. You would not have to concern regarding any of the weather risks. There’ll be greenery everywhere with lovely buckwheat plant. There’ll be plentiful different attractive panoramas one would wish to explore it daily. If explored around September, you’ll get to witness those magnificent orchards throughout. However, if you are adventurous enough, you will like to visit Muktinath any time of the year. 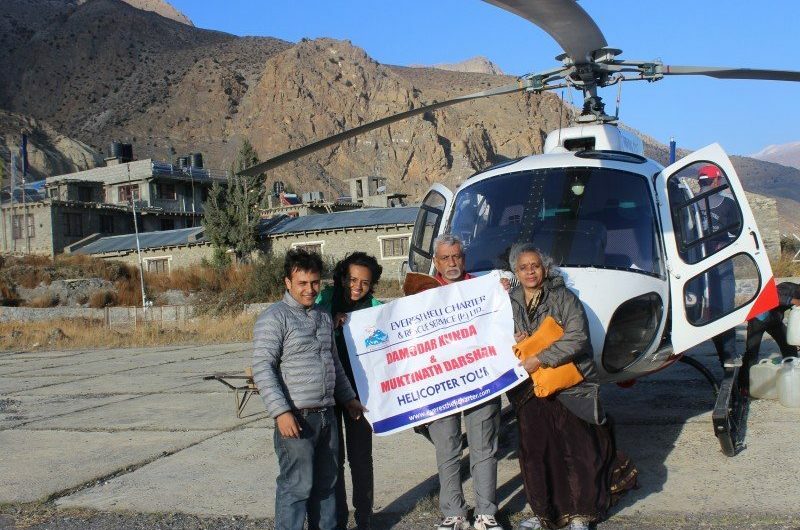 No matter whether you are going for Muktinath Helicotper tour or Muktinath Jeep Tour, you will be always delighted by the spiritual things available here. It’s said that all sorrows/miseries are alleviated once you pay a trip to the Muktinath Temple. The popular shrine of Lord Muktinath locates in the province of Mustang & is positioned approximately 18 kilometers north-east of Jomsom at a height of 3800m. The major temple is a pagoda-shaped shrine devoted to God Vishnu. Sets into fence around it are 108 whirlwind from which sacred water pour. The shrine is positioned on a high-mountain range & is toured throughout fair climate. There’re 2 ways to arrive at Muktinath from either through a flight journey from Pokhra-Jomsom & trek for 7 to eight hours from Jomsom or hike all the way from Pokhara via Kali-Gandaki gorge, which requires 7 to eight days. It’s said that one must travel this shrine after accomplishing pilgrimage of 4 special spiritual sites in India. This shrine held divine by both the Buddhists and Hindus. The Jwala Mai shrine close by features a spring & a never-ending flame nourished by organic gas belowground. Jomsom is a premier center in the Annapurna province. There’s a world class lodging amenity in Jomsom from where you can relish natural splendor. The most ideal for Muktinath temple tour is from March-May and October. In November and February it will get cold out there, but you can visit. December & January are ideal for the adventurous people as snow fall happens in all areas. June-September is the rainy month. We recommend carrying normal warm outfits with you. Woolen sweaters, light warm jackets, warm t-shirts, comfortable footwear, cotton pants and trousers are adequate for this trip. We also suggest you to bring heavy jacket for the winter season. There’re adequate hotels & lodges close by Muktinath in Ranipauwa and Jharkot. The hotels & lodges are absolutely fine here. Some hotels feature solar-heated hot showers & offers rooms with attached bathroom. Here you can also find local restaurants and they offer great food. There are also free lodging (Dharmasalas) for Hindu devotees. If you are not capable enough to walk the steep road, you better check out Muktinath tour by flight. There are several tour operators that are offering flight trip for Muktinath yatra. Otherwise you can look for a jeep tour to explore all the sightseeing it has to offer. Muktinath is a holy place and you must come here at least once in your life time to get moksha. Last but not the least always choose a reputed tour operator for the best possible experience. Nepal, 1st Aug, 2017 – Muktinath is a sacred place for both Hindus and Buddhists located in Muktinath Valley at an altitude of 3,710 meters at the foot of the Thorong La mountain pass (part of the Himalayas) in Mustang, Nepal. The site is close to the village of Ranipauwa, which is sometimes mistakenly called Muktinath. Established with the theme of providing quality service, Muktinath Temple Tour is one of the pioneering organizations in developing the concept of meaningful Muktinath Yatra. With high reputation and standard service we have catered thousands of prestigious clients where our clients’ satisfaction has always become our top most priority. We work with different professionals at different levels who work round the clock to make your Muktinath Darshan tour a success. Our company is registered with Nepal Government and associated with many organizations. From logistic management to facilitating you with information; we adapt our client according to their needs focusing on effective and efficient service. Your Mukthinath Darshan will be completed by all flights from Kathmandu to Jomsom via Pokhara and return. This trip fulfills your dream within five days. You can make unforgettable Yatra of Muktinath, Pashupatinath and many temples Darshan and sightseeing in Kathmandu, Pokhara and Muktinath. The Muktinath Temple is considered to be a Shakti Peetha for a yatra. Shakti Peethas are sacred abodes of Shakti (primordial cosmic energy), formed by the falling of body parts of the corpse of Sati Devi, when Lord Shiva carried it and wandered. There are 51 Shakti Peethas revered by Shaktism, connecting them to the 51 alphabets in Sanskrit. Each Shakti Peetha has a Shakti shrine and a Bhairava shrine in its temple. The Shakti of Muktinath is addressed as “Gandaki Chandi”, and the Bhairava as “Chakrapani”. Sati Devi’s temple on the forehead is believed to have fallen here. Muktinath Temple Tour offers all kind of travel package to Muktinath Temple. We also offer custom tour package to Muktinath , Pilgrimage Yatra, Helicopter tour to Muktinath Temple and tour packages to fit your interests and budget, and make sure you get the most of what you want from your holiday or Pilgirmage Journey. To know more about Muktinath package tour, visit us now. How to travel Muktinath Temple ? Muktinath Temple Tour offers all kind of travel package to Muktinath Temple. We also offer custom tour package to Muktinath , Pilgrimage Yatra, Helicopter tour to Muktinath Temple and tour packages to fit your interests and budget, and make sure you get the most of what you want from your holiday or Pilgirmage Journey.